Christmas is approaching and time to think of gifts for loved ones, friends and coworkers is getting shorter and shorter. The choice of Christmas gifts is not easy, one is afraid of being predictable, of making mistakes or of giving something useless. Don’t worry, in the cellar we are ready with wooden boxes, baskets, elegant gift boxes, ribbons, bows and decorations to prepare your gifts. During the Christmas period, the Franzosi Winery looks like an enchanted, welcoming, warm place, colored with a thousand lights, decorations and the ever-present large richly decorated tree in the center of the cellar. 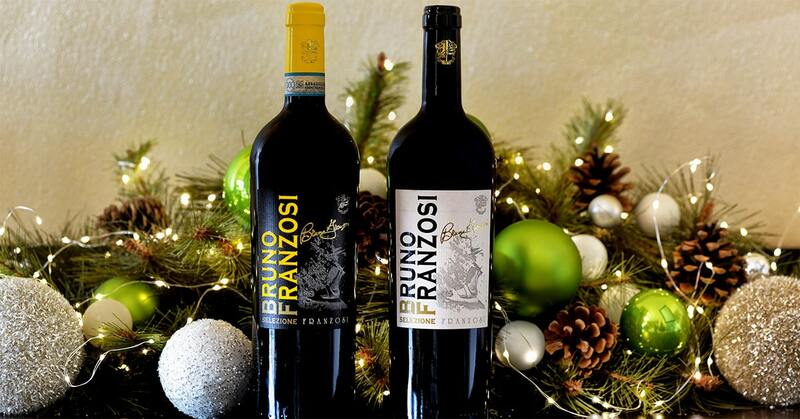 In the Franzosi winery you can live Christmas atmosphere with joy and carefree. It’s a real moment of union and sharing, a consolidated tradition with the passing of the years. “What is inside the Christmas packaging, is first of all tested and selected to be presented to the customer” says Paola Franzosi. “The cheeses, for instance, come from local dairies, that have been collaborating with us for years and are our partners. Goodness and quality are guaranteed! ” adds Giovanni Franzosi. You can delight the special people on your list with an assortment of Christmas gift baskets filled with holiday cheer to warm the home and the heart. Our stunning arrangements start with a variety of stylish, reusable bases, including baskets, boxes, tins, jars, and more. From there, each basket is chock-full of holiday goodies to tickle the fancy of any recipient. Whether your family members, friends, and coworkers prefer meat and cheese collections, chocolates, gourmet snacks, pasta, wines, olive oil, grappa, or combinations of all of the above, you’ll find the perfect assortment for every recipient. You can’t go wrong with collections featuring tons of sweet treats like cookies, chocolates, cocoa, Pandoro and Panettone, perfect for anyone with a sweet tooth. For those who prefer something savory, though, you’ll find baskets and boxes packed with meats, cheeses, salami, sausages, pesto and others that are sure to please. Depending on the tastes and preferences you can create personalized Christmas baskets, many special ideas for all tastes to give as gifts. Our Christmas gift baskets are prepared to make hearts merry! This the season for gifts styled to perfection. Even better, you can enjoy the convenience of gift basket delivery. All you have to do is peruse available gift baskets, select your favorites, and send them on their merry way. You just have to visit us in the cellar to see the selected range of products, displayed with care. The staff of the Franzosi winery will be available to advise and satisfy the customers’ wishes, even at the packaging level. “Despite the intense period, it is precisely the spirit of community and familiarity to make Christmas, assisting the customer at 360 degrees for us is a joy, a moment of sharing and privileged contact with customers and don’t worry, while you will be waiting, you can make a toast with our wines!” says Paola Franzosi. “The idea of Christmas baskets was born a bit ‘for fun, when one day I went to a historic distillery, with mum Ornella and dad Bruno. Here I saw many rich and elegant compositions, I was so pleasantly impressed, that I took the idea to offer our customers some baskets with our products” says joyfully Paola. This intuition was a winner in years to follow, confirmed by the success of the food and wine packs in Italy and abroad. “Even our importers have specialized in Christmas proposals, they insert the products offered by the winery, attracted by the goodness of the products tasted and year after year are enthusiastic about the service received” says Paola. This gives great pride and enthusiasm to the Franzosi family, driven by a desire for continuous improvement. Let yourself be intrigued by some advices from our staff why give a wine for Christmas is an ideal gift and not only. The first fundamental rule to make the perfect Christmas present is to not repeat the same thought twice. The surprise when you discard or open a gift is a unique emotion, so find out if possible the tastes and preferences of your receivers, it will be useful for the choice of gift. A bottle of wine, olive oil, grappa, gastronomic specialties to savor and taste. Wine is the right gift to make a good impression on every occasion and the statistics confirm that it is also one of the most appreciated gifts, not just for Christmas. An extra tip: when you buy a wine to give away, to make everything even more special, find out how it is produced and its pairings … little things that will make the difference. Especially during Christmas, the opportunities to uncork a good bottle in a good company will not be missing. Sophisticated palates will delight at the flavor sensations provided by baskets featuring gourmet chocolates, especially when teamed with sweet truffle, or even with full-bodied red wine. There’s just no end of ways to show your love and appreciation this holiday season when you go gourmet. For the hard-to-please gift recipients on your Christmas list, we offer a wide range of gourmet foods, and more to suit every taste. It is good to remember that a wine can cover very different budgets: depending on how much you want to spend, you will surely find the perfect solution to your needs. Discover how in our showroom you will find all what you are looking for. Inside each gift there is a link, a feeling of affection, a gesture of gratitude. It is nice to leave a package with a story to tell under the tree. Christmas is a great party to find peace with your loved ones. So why not give away something to share during the holidays? Come and enjoy Christmas with us, we have ideas and solutions to fulfill all your wishes. What are you waiting for? Discover here our gift proposals, click here.